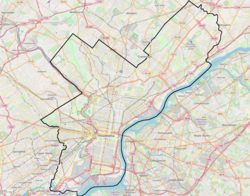 The Centennial District is a 700 acre section of West Philadelphia, Pennsylvania that contains the Philadelphia Zoo, the Please Touch Museum and the Mann Music Center. The neighborhood sits on a section of town that was the location of the 1876 Centennial Exposition, which was 100 years after the founding of the United States with the signing of the Declaration of Independence. The area is part of a plan to incorporate parts of present-day Fairmount Park to revitalize neighborhoods in the area for the year 2026. Streetcar service along Girard Avenue is provided by SEPTA's Route 15 trolley. ^ "Fairmount Park Centennial District Master Plan". locus-partners.com. Locus Partners. ^ "The Centennial District Economic Development Strategy" (PDF). ^ "Reviving park's legacy Thriving Centennial District seen for Fairmount. Seeing park district as engine for renewal". This page was last edited on 7 September 2018, at 18:54 (UTC).